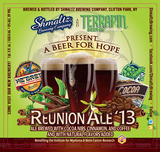 This year’s beer is a dark ale brewed with cinnamon with vanilla, coffee, and cocoa nibs added. It was inspired by a fantastic dessert we used to share with Virginia at our favorite restaurant. The Brown ale leads with a bold coffee and subtle cinnamon aroma. Complex malt overtones quickly give way to a chocolate, coffee and vanilla mix of satisfying bliss.